The LGBTQ+ community faces a unique set of challenges in America. In addition to fighting for acceptance and legal rights in society, the LGBTQ+ community has a higher risk of other problems when compared to the general population, including mental illness, homelessness, and substance abuse. At Desert Hope Treatment Center, we’re committed to treating our patients as individuals and addressing the unique challenges in life that led them down the path of substance abuse. With that in mind, we decided to conduct a survey centered around LGBTQ+ drug use and how it compares to heterosexual individuals. We ran a nationwide survey of 1,700 Americans who admitted to using or abusing drugs with over 400 of them identifying as LGBTQ+. One of the first questions we asked was the age that the respondent first started using illicit drugs. Our survey found that the LGBTQ+ individuals started using at younger ages. 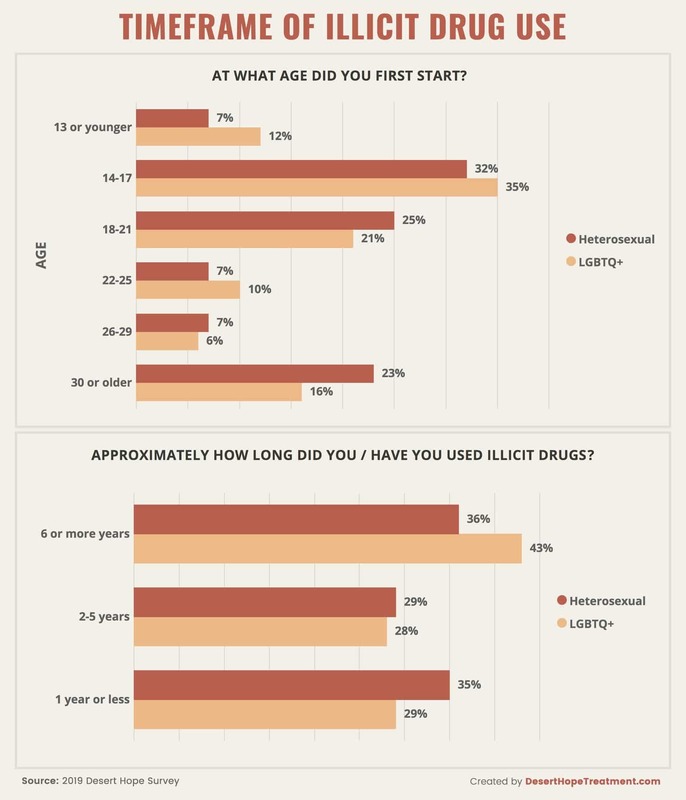 In particular, LGBTQ+ respondents were more likely than heterosexual respondents to start using illicit drugs at 13 years old or younger (12% – 7%). Additionally, LGBTQ+ had a higher rate of starting between 14-17 years old. We also found that LGBTQ+ people are more likely to use drugs for a longer period of time. 43% of individuals said they used for 6 or more years compared to the 36% of heterosexual respondents that used for that same time period. 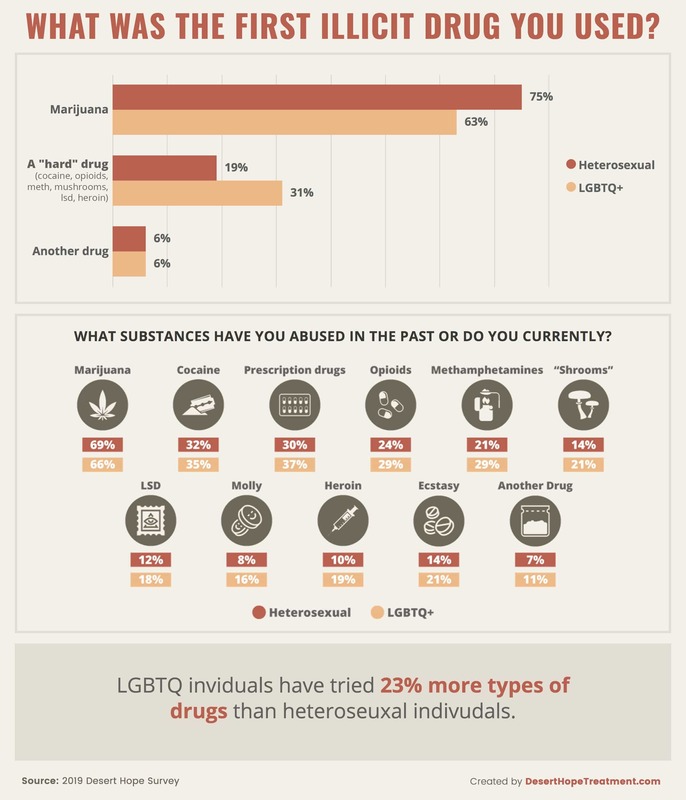 When it came to the specific drugs used, our survey showed that LGBTQ+ individuals start with a harder drug (such as cocaine, meth, heroin, etc.) than heterosexual individuals by a significant margin (31% as compared to 19%). Additionally, members of the community are more likely to try more types of drugs. 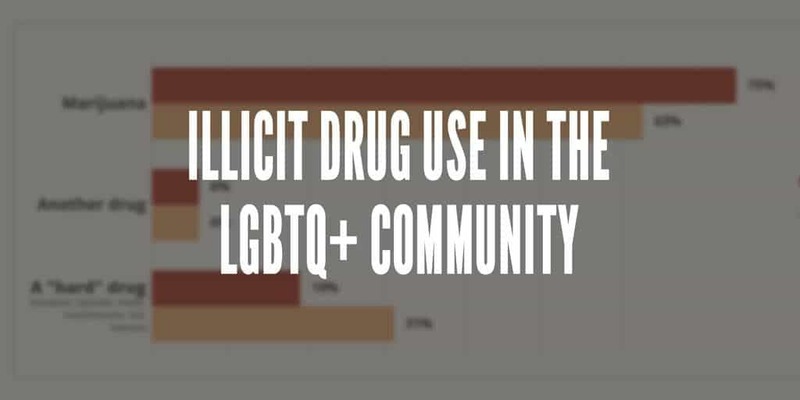 Our survey found that, on average, an LGBTQ+ person who uses drugs will use 3.18 different types of drugs compared to 2.57 for heterosexual respondents. Next, we asked about the reasons that respondents started using drugs. What stood out here was that LGBTQ+ users had a higher response rate of use stemming from depression or loneliness which correlates with studies that have found a higher rate of mental illness among community members. 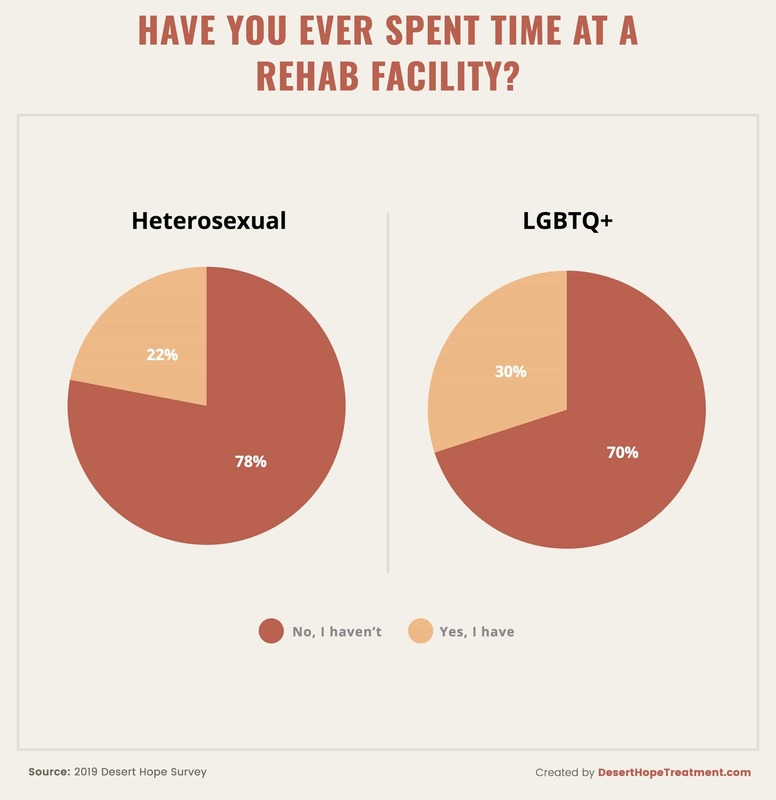 We also asked if respondents had spent time in a rehab facility. 30% of LGBTQ+ respondents said they had spent some amount of time. This was again a higher rate than our heterosexual respondents. At Desert Hope Treatment, we’re committed to providing a support system and a way for people to get help when they need it. 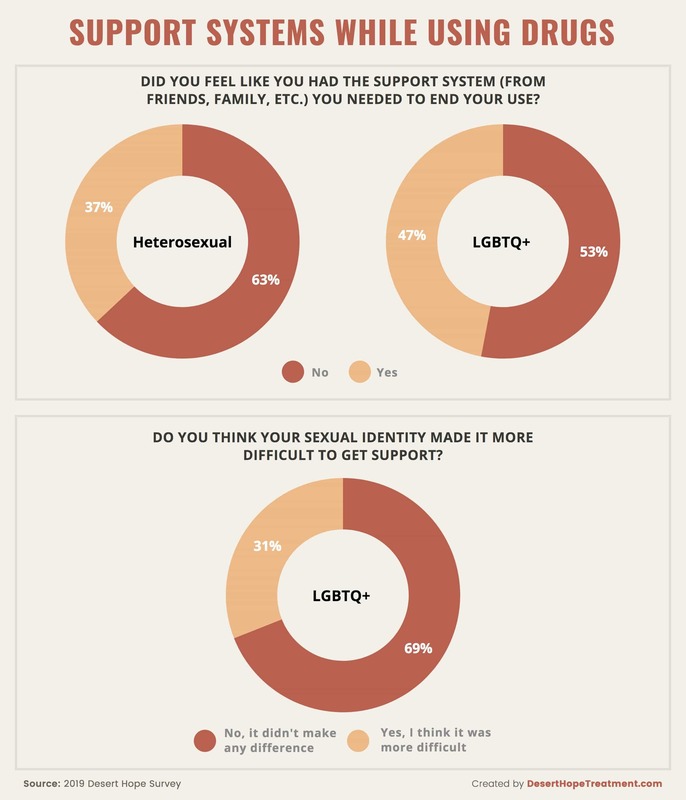 With that in mind, we asked respondents about their support systems and if they felt their sexuality made a difference in their ability to get help. We found that nearly half (47%) of LGBTQ+ individuals did not feel like they had a support system when they needed to end their use. Additionally, 30% felt that their sexuality made it more difficult to get the help they needed. These are alarming statistics and ones that we are committed to helping reduce. Overall, it’s clear that we as a nation face a serious drug use and abuse problem. This problem spans across all ages, races, genders, and sexualities and is one that we need to work together to solve. 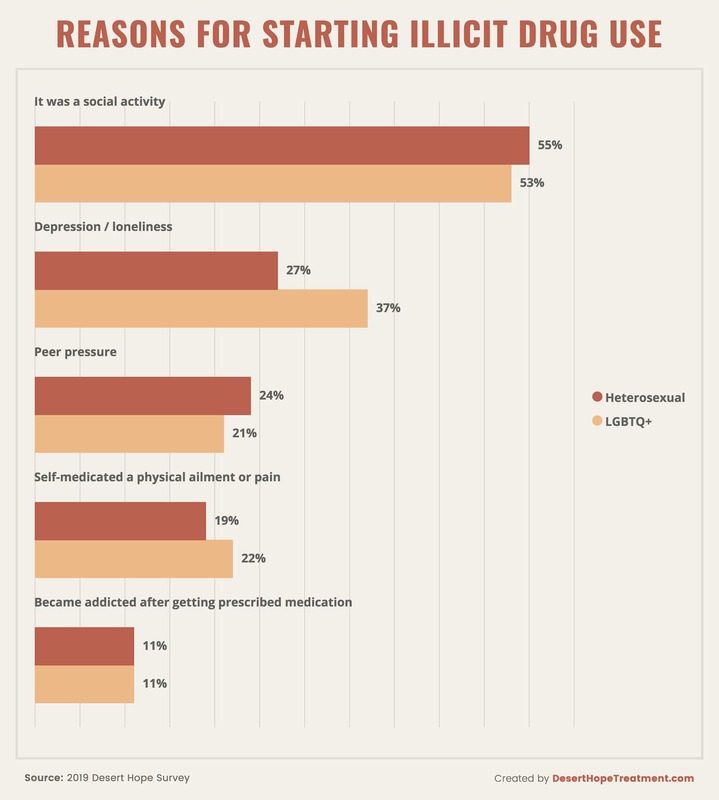 The LGBTQ+ community, in particular, faces problems from drug use and abuse at a higher rate than other groups and often do not feel like they are able to get the support that they need. We’re aiming to help and one of the first steps is to identify the problems and where the help is needed. Desert Hope and American Addiction Centers are proud to help individuals of all backgrounds when they need it most. The information and graphics in this blog post can be used and displayed by all commercial and non-commercial websites without charge. However, use is only permitted with proper attribution to DesertHopeTreatment.com. When using this information or any of these graphics, please include a backlink to this page.